Tell Eurostar a funny little story of the unexpected. There is a lot more to traveling than visiting monuments and following the guidebook. It’s about straying off the beaten track and opening yourself up to the unexpected. Exploring the unique and quirky goings-on in European cities can be a much greater thrill and a good opportunity to live exciting adventures that you can’t wait to share with your friends. Check out Eurostar's “Stories are waiting” campaign. These videos explore the real side of traveling that comes from discovering odd and wonderful things in any one their cities. What about you? What is your story? Do you want to inspire travelers to hop on the Eurostar and visit one of these places? (Paris, Brussels, London, Amsterdam, Cologne, Antwerp, Lille, Lyon, Strasbourg, Bruges and the South of France) Create a witty and fun video or animation that tells a story of the unexpected things you’ve discovered in one of Eurostar’s destinations, and take your chance to be broadcast on Eurostar channels! Format: videos or animations. Indicative length is 60 sec but it can be longer if needed. 5 winners will be awarded! Send your stories before January, 19th 2014! And as always leave your questions on Discuss tab! 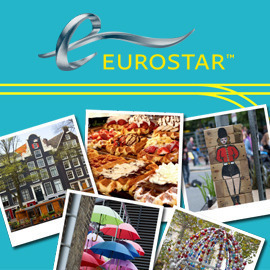 Some tips on Eurostar Stories contest!